December 1st 2008. Happy anniversary to ELLEN and ME! 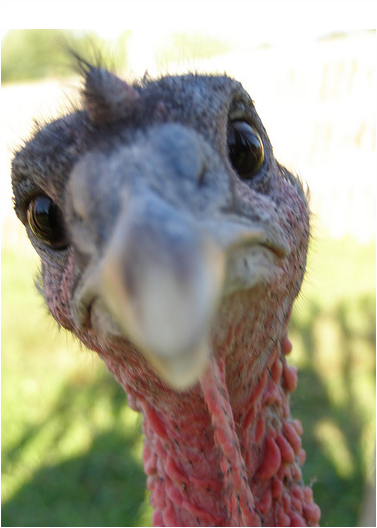 Thanksgiving day was not as hard as I was fearing. My sister in law Pam, made a great dinner, and both her and my family were there. We sat at opposite ends of the table. I do not know why we all get along great, it just seems to work that way. I had some turkey and some ham. It got stuck, but it was fine in the end. The big news is I hit 350! The lightest I have been in quite a while. I have blown away my Atkins diet weight and heading for thinville! I have even bigger news. I actually ate three meals yesterday. Ellen made me a cheddar omelet for breakfast, lunch was a can of soup and dinner was elbow pasta with meat sauce (Ground chicken). I finished half a bowl and it was great. Nothing got stuck, I did not dump, and it was awesome! I took my mid term for Earth Science and I think I did real well. It was a bear. 11 essay questions. All in all a good weekend. I feel good. Too good to worry about my ankle pain. Thursday December 4th 2008. Feeling better today. My ankle is not so sore and I feel pretty good. I have only had about 4 days like this since the surgery. Usually it is gout, ankle pain, itching, or some other problem but as they say I am sick of being sick. I am tired of being miserable. It just need a shot of something to prove I am still a functioning member of the human race and not some medical curiosity of side effects. I think I have made up my mind that if I think I feel better I will feel better. Friday December 5th, 2008. Each morning seems to get a little better pain wise. Either I am learning to accept this much pain or it is actually getting better. Last night I went in to Vo-Tech and taught my first class since the surgery. I have been out for a month. One student showed up. Well, we made lots of progress one on one! Ellen was saying last night my blog entry yesterday was so upbeat she had hoped I would be better when I got home. After a nights rest I am in pretty good shape but as the day goes on I begin to drag, and then the ankle really gets to me. So when she sees me at the end of the day I am a wreck. It seems like my best shape is reserved and even amplified for my coworkers, and when with family and friends I lay aside the thoughtful considerations that are foundation of the social graces. I hope this pain passes soon. Pain is an evil thing. It changes you into a person that nobody wants to be with, and everyone takes pity on. I have grown tired and weary of being miserable all of the time, I pray I am just strong enough to overcome it. Perhaps I just need to do something that feels good for a change. Monday December 8th 2008. The day after Pearl Harbor day. I would have thought there would been more fanfare, on TV yesterday, but nothing much to speak of. I did break two more barriers. One is I ran out of blood pressure pills. The bottle said no refills so I am thinking that should be the end of the line on those. Also I broke 350 barrier. Now I am 346. It will be nice to get on my GP's scale and not have the one at a time please message pop up. My ankle hurts today. Yesterday was much better. Today not so much. I should not do stupid things like go downstairs for three loads of firewood because I felt better. (And Cold) I did spend most of the weekend on homework, and to that end, did not get a lot accomplished in either my term paper, or my final Linux project. I did get a lot of homework done though. Next week is finals and I cant wait to be out for winter break. I really am tired of school. Going year round doesn't give you the break you need. I did go to Eastern Star on Friday, and met with someone else who went through the surgery. She repeatedly assured me that all of this I am going through, and have gone through is normal, and in a month it would be much better. I really hope so. I went to the Chamber of commerce meet and greet last night at the Sherman, and spent way too much time on my feet last night. I am a hurtin puppy this am! I was actually much later than usual getting out of the house because of being in so much pain. I hate pain as you have read above, and really do not seem to see any light at the end of the tunnel. Perhaps protein will help. I have been faithfully back on allopurinol for a month now and the gout should be gone at this point. I should really start stocking up on protein, build muscle, and see if that helps. I also need to work on my fluid intake, that has slowed up a lot it seems, but I did have three glasses of iced tea with dinner last night, in addition to a 20 oz bottle of water, and a half of a 16.9 oz bottle of water at work. So I am not sure what that adds up to, but I bet I need more. Thursday December 11th 2008. 346 pounds 57 pounds lighter. Yesterday I went to the Doctors office for my one month (5 Week) checkup. Aside from all of my side effects he feels I am doing great. I need more water, and I need more protein, but other than that..... All is well. He wants me to go to my GP for treatment of the side effects. I realize he is a specialist, and the GP might know more about each individual issue. A pic for those looking for one. BP was 160/94 I don't understand this, before the surgery I was never over 140/70. Perhaps it has something to do with all of the pain I am in, the fear that something else might do wrong, or just stress. I am going to make an appt with the GP to discuss. (After Finals are over) Either way the surgeon pulled me off the BP meds as he feels I no longer need them. My BP on and off the meds was about the same anyway. Friday December 12th (A good day) No pain in my ankle or foot this AM. Mussels are real stiff, but that is to be expected with the lack of use of the foot and leg. One thing that I have been thinking this morning is I have been neglecting Ellen in this blog. I know a lot of readers keep asking how Ellen is doing, and I usually answer: Fine, on track, lost about 35 pounds, Doctor is happy, no side effects so far, but we need to begin our gallbladder meds. There are a couple of things I may have left out of my report. She looks rockin! I always love her no matter how heavy she is, she is always a vibrant beautiful woman who is far more intelligent than I am. But to add to that she is looking great. I will most likely be thinking about her all day today. It is important that we all dress well. Men as they loose weight don't like buying clothes as they will not fit for long, and who cares if my clothes are baggy, but if Ellen wears clothes that fit her well, she is smokin! I am not completely sure what Ellen looks like when you see her, but when I see her, this is what I see and she has always looked like this to me. I am sure I have caught you all up (and embarrassed her enough) to let me get back to our regularly scheduled program. Some secrets shared.... or not! Monday December 15th 2008 a Solid 341. for those of you that do not do math, that is 62 pounds off. 52 according the Dr. Bertha's scale. (I wear clothes on his when I weigh, and my lift on my left shoe weighs 5 pounds alone. Well, finals are over. Finally a break. I have a lot to squeeze in in the next 3-4 weeks, I needs to get to my GP and speak with him about BP and the itches but other than that I seem to be doing fine. I was at my desk with my finals for the past 48 hours, so my back, ankle and neck are stiff. But I got everything completed and handed in so I am guessing all should be well. I went into the finals with a 99 and a 91 in the two classes, so we will see what I end up with. I hit a couple of major milestones in regards to weight loss this weekend, but frankly they are pretty personal so I wont go into them. Suffice to say I have not been able to do them for a while, and I am pretty happy about being able to do them now. I think this is about what I weighed when I got married, so I could say I haven't been this thin in 18 years. I don't feel any thinner but people tell me I sure look thinner. Tuesday December 16th 2008 I did not weigh in this morning, after all I can't do it every day. Lets stick to the 341 number for now. I went to a lodge rehearsal last night. It was nice to get back to a normal routine, and the guys there had not seen me since October. They needed to get caught up on my experiences. Getting up and down from my chair was a challenge and one I will have to work on. My ankle still hurts and my legs are weak. I think I need to start exercising them more. Getting up and down without holding on to anything to steady me would be a good start. Today's picture is largely symbolic. Did you ever feel like life was chasseing you? I want to get back to normal. I think life wants me back to normal. I know work wants me back to normal. But life is the hippo and that to some degree is me running from it. 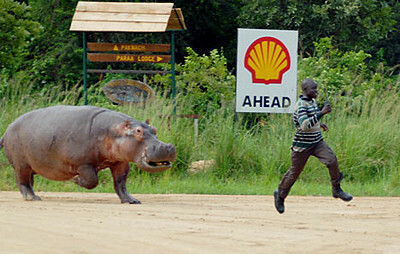 If you have ever run from a hippo, (I would assume most of you have not.) it most likely will catch you eventually. (Unless you can keep running long enough) I guess it is time to let life overtake me. I've lost that standing feeling. Wednesday December 17th. I am noticing that my legs and back do not want to hold me up for long. I get about 15 minutes standing and that's it. Ellen got home late last night so I stopped to pick up dinner. It did not go down well. I had to wait a half hour for the order standing, and I was in agony most of the night. I think it is time to start the protein bullets again, and see how the gout deals with it. I should have enough allopurinol in my system to ward it off and I am sure my protein levels are really low. 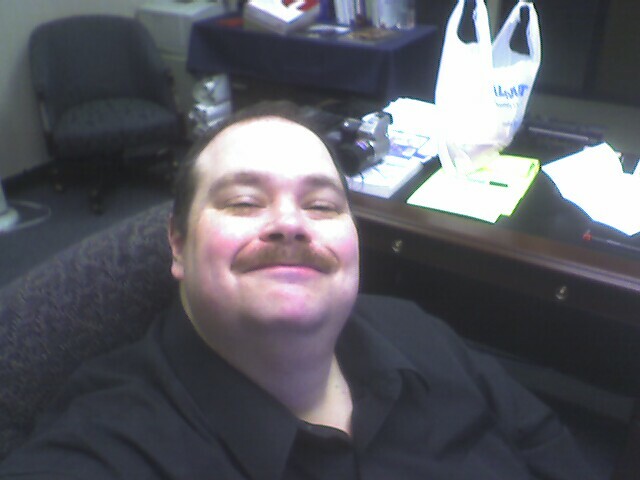 This picture Intentionally left blank 339 lbs this morning Thursday December 18th. Not a good day today. Nothing to add. Don't want to talk about it. 339 and holding its Friday December 19th. I am enjoying being off from school until January 9th, I almost don't want to go back! I did go teach at VoTech. This is really hard since they won't load the program I am teaching in on the PC's in my classroom! I do need to get my script picked up at the drug store, I am showing/feeling gallbladder issues. Perhaps I can remember get it on the way home. 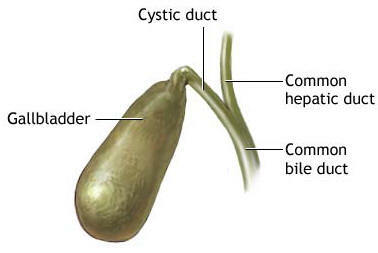 Gallbladder problems scare the crap out of me. I DON'T want to go back for more surgery. That scares me that I might not rebound from the next one. I will get the script and make it all happen, fear is a huge motivator. 337 today December 22 2008. Still loosing and loosing well. I did have an active weekend. Ellen dragged me through seemingly 500 stores this weekend under the guise of shopping, but really I know it was to get me some exercise. I did well until I was done with Shiffs Cash and Carry, and then I was about out. Did I say out? By the way I also went to Koles, Staples, Radio Shack, The Hallmark Store, and the State Store (Vodka for the Xmas day dinner). But by then I (and my ankle) was done, and was looking forward to a quiet (and hopefully romantic) evening at home. (All prayers are answered, just sometimes the answer is no) Sunday I wired the surround sound system so Ellen could have her Xmas music in the living room, and worked a lot on the brochure for the Vo-Tech. We also went out during a heavy snowstorm to go get a Xmas Tree. We have been going to the same place for 18 years! Regina Farms seemed quiet yesterday, I hope it was just the snow, They seem like nice people. I admit the economy has everyone cutting back. We rarely leave there without dropping a hundred bucks or so, and yesterday we got out with a $15.00 tree and a $12.00 bauble. it was refreshingly cheap. I wanted to take a moment to tell you how great our new (New to us) bronco has done. That sure footed little truck seems to go anywhere any time. I am quickly falling in love with that little vehicle. Someday (Ed, if your reading this I hope it is soon) I will get my truck back. I love my GMC, but this little Bronco is really nice. (Thank you Freda!) Another announcement: I have named the little truck: In honor of his last owner I named him Bob the Bronco. I think that's a fitting name. Bob was a hard working I can do anything kind of guy and so is his truck. 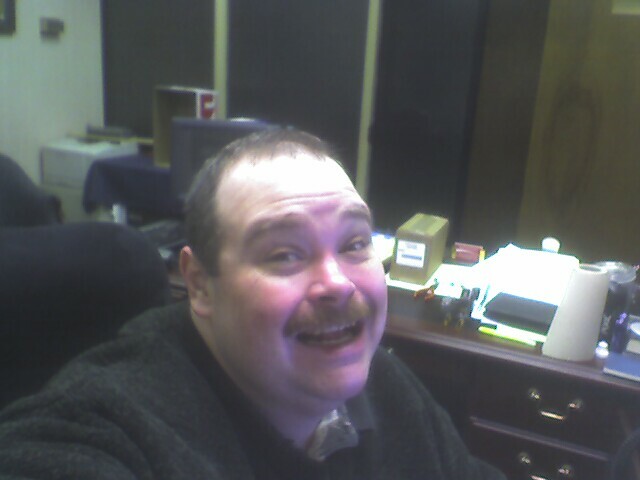 I miss Bob, A great guy who would always tell you the truth with a smile. Speaking of love.... Ellen and Zach must have been running late this morning because they left me to lock up the dogs. 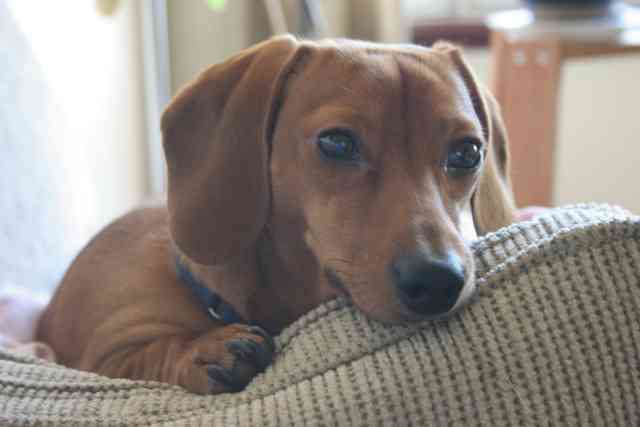 That friggin Bert the brown Dachshund, made me chase him around the dinning room, kitchen, and living room 7 times this morning. I don't know why the hell he will not go into his crate. Other times he is just fine to go in but he really did not want in this morning at all. I don't think it would bother me so much but he is the cutest most unloving, ungrateful dog you have ever met. No matter what I do I just can't get him to warm up to me. He lives life like it is owed to him. He shows no interest in me at all except to steal my blanket at night. I bet Dingo Dogs are more affectionate. Ellen was also nice enough to start the Bronco this morning so it would be warm when I took it to work. Nice gesture. The back window was left down, and it was really cold, but a nice gesture all the same. It was pretty chilly this morning too. I think around 10 degrees. It is supposed to get warmer later in the week. Blog Blog Blog.... These mornings are feeling a little one sided. I talk and no replies. 336.5 Pounds and still loosing. Last night I went to Zach's Choral concert and they did a Christmas theme. This was no surprise considering the season. After all it is December 23rd of 2008 (Snuck the date in there, see am I not clever?) But it was not a politically correct concert. No Jewish theme, and Kwanza was curiously absent. As Christians we have been taught for the last 20 years that it is wrong to do this, and that it offends the other denominations of religion to have a purely Christmas celebration in our public schools. After all a huge teaching in Christianity is "Turn the other cheek." These are the same schools who removed the rule that you had to say the pledge of allegiance each morning, and removed prayer from public school even back in my day. (I did not care what they said I prayed before each math test I took. That taught me that all prayers are answered, just sometimes the answer is no!) I applaud the school for taking this risk. But religious sensitivity has been so drummed into my head, that I spent the concert feeling guilty. I should not have to feel that way. I went to enjoy the season. If I wanted to spend my time feeling guilty about something, I would have been Jewish or Catholic. (Sorry RJ, Karen & Barbra) Anyway, I Just thought I would extend to all of you my feelings on this and to which you all the holiday spirit. No matter what religion you are, I urge you to go out and by a Xmas tree. It is good for the economy! Well 2008 is almost at a close, I am George T. Mason, reporting to you live on December 24th 2008. 335 pounds this AM. Things are well, the Xmas crunch in on. Zach will be stopping by about 3:30 and at the end of the day we are going Xmas shopping for Ellen. I have lot's of ideas for Ellen (And some for her gifts too) I am sure Ellen will go home today after her work, and slave away on the house so everyone sees it spotless, and then wrap gifts to 2 AM like she does every year. Xmas should be spent close to ones family, not locked in a room wrapping gifts. Well, everyone has their curse, Mine is shopping on Xmas eve and hers is wrapping. Someone said to me last night that this surgery is a blessing and everyone overweight should have one. I disagree. This is nice to be thinner. I have dreamed about being thin all my life it seems but now that I am heading that way, I am not so sure that was the best aim. Ever wish for something, and make up an idea in you mind how great it will be, only to be let down when reality hits. That's kind of where I am now. I always said I will do this when I am thinner, and that when I am thinner, and now I am not doing them. Also had two other dreams that fell by the wayside in the mean time. One was to find someone to love me. (Ok, I got that one, but I never appreciate it enough.) the other was to be happy. I equated thin to happy and so far that is not really true. Although I new fit back into my silk boxers and except for the waterslide that is pretty close to happy), still that is not quite there yet. Happiness is an elusive thing, and you might actually have it and do not know it. So of all things to wish for, try to wish to be happy, and above all things, I hope you get it, or even better I hope you find out that you already have it, and you discover how happy you really are. I have been told I need a need a new pic so I got you all one. So I am signing off until Monday December 29th, Happy Holidays to all! So, it is the 29th of December and I am a record, or to be more precise an LP. What I mean is I weighed in at 333. Get it A long play record spins at 333 RPM! Ok, I am an old audiophile and that is an old audiophile joke. Anyway, A book Christmas was had this year with me getting a bunch of books, Stroudsburgs, now and then, Diners, Drive-ins, and Dives cookbook, and a book on Centralia, PA, and a Civil War book, it was an educational Christmas to say the least. I got Ellen a new couple of meaningful Department 56 items for her collection. What that is all about is I tend give her something from Department 56 that has a remembrance of something we have done in the past. If I can I make it from the past year. She can then look at the village as our collection of memories. This year I got her a BBQ shack (To remember meat fest) and a Lobster pound (Just because we have gone to one before). (See pictures at left). It was a day also filled with good friends and good memories. The weekend was busy, we seemed to run everywhere. I make a turning point this weekend. I was so unhappy and have been for a while, and then for some reason on Saturday something came over me that just completed me. I have been going around with a song in my heart and a spring in my step since! I feel so much better now, my heart is so full I am not sure it will not burst! Happy Happy Happy am I! Sunday we went down to do inventory at the lodge in Mountain Lakes. Afterward we went to Fuddruckers with two other couples for dinner. Normally Ellen and I do not like going out any more. It is expensive, and we hardly eat anything. We could share plates but most times we do not like the same things. True to form we ordered two dinners, I got a hamburger made out of an Ostrich, and Ellen got a beef patty. We both finished about half. Afterward we went to our friends Eric and Mary's Apartment, I now like to call it Eric's crack den of snacks I should not have. There I got to fix two laptops. (Yea!) While we were there Eric kept presenting me with snacks. Are you kidding me? Chips, Pretzels, Corn Chips, Cookies, Cheetos, I was ready to kill him! He talks me into this surgery, Speaks of how proud of me he is, and then plies me with junk food. I indulged, but not to excess. (At one time it would have been a bag of each of these.) The inventory was 5 pretzel sticks, three lays sour cream and onion potato chips, a sun chip of some sort, and no cookies. Welcome to Eric's mind screw! I don't think I have shared with you all about one of the reasons I began to overeat in the first place. I am not Freudian by any means. I do not feel that all of my problems stem from my mother. That having been said, I do have a couple of facts that must have contributed here or there. My mother lost a child at three years old to a drowning accident. She never 100% got over that. I came along four years later when my mother was 36. She and my Dad were pretty much out of the kid business at that point. Her idea of keeping me quiet and out of her hair, was to sit me down in front of the TV with a can of Charles Chips or Pretzels. I grew up on Sesame Street and The Electric Company, and Zoom and of course snack food, while I got fatter and fatter and fatter. Over the years Chips have always been my downfall. They call to me and I respond like Pavlov's fat man. One to the things I love about the surgery is the ability to only have three chips and be stuffed. I can eat only one Lays potato chip! There have been other contributions to my end all weight of 425, but the Charles Chips company, TV, and My Mother paved a good path to start on. I am back on the wagon, and there are those that say that was not an over indulgence at all, but like one drink to an alcoholic, it sure seemed tempting. I never want to be morbidly obese again once I loose it. Keeping away from those snack foods will help that. But taking them out of my life is not the end all answer either. I need to learn to live with them. They are everywhere. and I need to form a relationship with snack foods that I can remain on the right path. As this blog is really directed as my musings and not really for anyone but me I am about to issue a warning. Prepare yourself for TMI. Civility sweet civility. I am sitting at my desk at 7:02 AM, about an hour before work begins sipping on a Bentley raspberry tea made in my own Mr. Coffee, in my own office dressed in my Xmas argyle sweater, linen trousers, silk underwear, comfortable shoes. Ahhh! Sweet quiet and civility. Last night was a little off. Ellen made Spaghetti and we both threw up. Then I consumed 99% of a can of pistachio nuts. They have protein so I guess I am covered, but I should not do that. I felt over stuffed when I was finished. I am becoming quite a tea drinker as of late. I love hot tea these days. I guess I did not get Eric out of my system yesterday. As my thoughts are returning to him. Eric is the nicest guy who ever ran a junk food crack den. He would do anything for anyone. I am concerned for his financial future. When we went over to the office yesterday it was a hell of a mess, and in my opinion not suitable for seeing clients. I know he was aiming for a look more like the Mountain Lakes office and with the amount of stuff he has in the bullpen, it just is not happening. They are in a state of flux moving from the apartment to the house, and stuff needs to go somewhere, but that is most likely not the place for it. He needs to retain an image, and that office is not the image he needs to retain. I know he has one hell of an outstanding nut out there and I am not sure what I can do to help him. He saw what I went through with the business and here he is to some degree following a similar path. Right now he has the advantages, he needs to make use of them. Clean up the car to take clients to show houses, clean up the office to meet clients, and lay off the junk food, before the surgery was a waste of time. I know these are big words for for me as I have the same faults. I suppose there is nothing to do but wait and see and be there for him if the worst happens. I do not hope for that, but a friend can only be a friend if he is in need. Right now Eric is on the top of the world. I just hope he can stay there. As for me I need to get to work. Ted came up last night. I have spoken about Ted before, He came up to the hospital to see me and visit. He, Bob and Eric are the friends who did. Leslie, Laura, and other family came too, but as far as friends, Ted, Bob and Eric were it. Anyway Ted is not happy with my weight loss. He is bordering on 300 pounds. I am now 332. Soon I will not be the fat guy in our merry little band and that is making Ted really uncomfortable. He is telling me he is going to diet and exercise his way ahead of me. Ted has very low self esteem, and making me the object of ridicule in his mind "At least I am not as fat as George" has kept him going for a number of years. We would go to Wendy's after and AutoCAD class we took together and he would mock me for what I was eating (While he was eating the same thing I might add). It is ok. I did the same thing in School. There were some kids bigger than me, some the same size, and a lot of them smaller. I used to think I was ok because I was on par with John, or Gavin, or Pat, and be ok with it especially if I was smaller than Bill, or Joe, or Al. Whatever it takes for you to get through life, if fine with me as long as it doesn't hurt anyone. Anyway Ted swore to me last night that he will never let me get ahead of him in weight loss. Good luck with that Ted, The thinner you are (Within Bounds) the healthier you are. If I am to be his motivation then so be it. I am still a big enough man to be ok with that. Compulsions are funny things. I am a compulsive guy. I can admit that. I used to eat compulsively, buy compulsively, and love (Physically) compulsively. This is the way I went / go through life. The surgery no longer allows you to eat compulsively, and finances no longer allow me to buy compulsively, Loving (Physically) compulsively is always limited by the cooperation of a partner. So I am running with all of my compulsions restrained. I am learning to live with that better than I expected I would. When they happen I am really happy, but when they don't that is not the end of the world. But some people ask how I am feeling. I have to pause here. Physically? fine I guess mentally I am pretty unhappy unless something wonderful happens like last Saturday. Then I was on cloud nine, and have been since. But from day to day I miss the compulsions that used to keep me going day to day. Partner not feeling well? No problem buy something! Funds running a little low? No big deal have a couple of triples at Wendy's! (1,930 Calories) Gotta have the Biggie fries and get this: Light Lemonade with that! now we are up to 2,490 calories. But still under 15 bucks, and a feel good full that would last for hours. Now that is a compulsion, but not one you can live with for long. To some degree I am glad that compulsion is permanently behind me. Not that compulsive behavior is always a bad thing. I have compulsively given to charity, and, dropped in on friends, Romance for me is a compulsion, I love to love compulsively it is spontaneous, extemporaneous, exiting, and every time it has happened Ellen has always loved it. Roses for a reason are nice. Good boy. 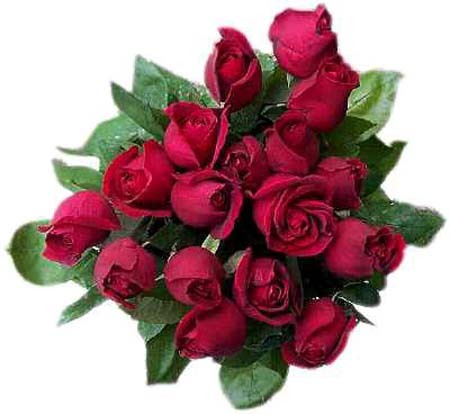 Roses for no reason other than someone felt enough love for you in his heart that he just had to burst fourth in a sign to show it are memories that make it into your permanent memories. In a box of memories that we call our lives, life is not measured by every breath you take, but those moments that take your breath away. Show me a romantic, I will show you a compulsive person, it is all in how you like your half glass of water, Half full? or Half empty. If you live with someone like that, hold on and enjoy the ride, it is full of us and downs. Find ways to channel their compulsions into positive outlets if you don't I assure you either they will find a way to channel them into negative ones (2,490 calories) or just be a miserable f--k all the time. New years eve, a challenging festive occasion for the overeater. With luck my only overindulgence was a bunch of cucumber. That was not so bad, I did have some dip and four Swedish meatballs. (protein was my excuse) and four (Apparently my magic number) potato chips, and about a dozen scoops corn chips. so I guess I did well. I am at 331 this morning so I guess I am still on track. 2008 will be a bittersweet memory for me and we all have high hopes for 2009. New Years Day breakfast did not go well, I felt really sick afterwards but after some rest I felt much better. New Years dinner went fine, but I slept horrible last night. I am sure my BP was us as I could hear my heartbeat in my ears. I do have an appt with my GP this weekend. I am exited by this, as I am for the first time in years I will be able to be weighed on the regular scale. This will be real cool. I will need to speak to him about my scripts and see what he thinks about my BP.